Bridges and Barriers is the North Kelvin Sports Development Group’s successful anti-sectarian project that has been delivered across the north-west of Glasgow since August 2013. Our flagship program is back with a bang for 2018/19 with lots of new and exciting news to come this coming school year. Due to the continued success and growth of B&B we are delighted to have added a new coach to our ranks, Conor Mitchell joins us and will bring a new perspective and host of new skills to the team. Bridges and Barriers has been the organisations flagship community project since its inception in 2013. Our Scottish Government funded project has achieved a tremendous amount of success delivering anti-sectarian education across our community through a variety of delivery sites using a set of specifically tailored teaching resources developed by project staff. The project addresses the key behaviour traits that result in sectarianism whilst also addressing the relevant language, historical and cultural context and personal rights and responsibilities. The project has used our successful delivery model of promoting personal and social development by providing educational workshops alongside sports participation. This has proven extremely effective as sport is used as an incentive and a reward for engaging in short educational workshops. These sessions have proven to be extremely popular by participants and community partners as this entirely free service is delivered by respected staff who have developed positive relationships with the client group through sports participation in a relaxed and enjoyable environment. Andrew is the Project Coordinator for our award-winning Bridges & Barriers project. He has brought with him relevant, progressive experience and a passion for developing community projects that deliver social change. Andrew has been able to create new and lasting partnerships with Active Schools Coordinators all throughout Glasgow and beyond since August 2017. Andrew is the main coach delivering sessions but also manages all aspects of the project as well as developing coaches and volunteers to deliver these sessions. "In the last few years, I have developed award winning projects for AMsoccer Club and Links Park Community Trust. In Montrose I created sustainable projects for LPCT such as Mental Health Football sessions at the Susan Carnegie Centre, Walking Football, Women's Walking Football, Health Walks, Walk Leader Training, Football Memories (for people who live with dementia) and also a sports related Employability Programme with the DWP Previous to LPCT, in Cupar with AMS, I was the Club Coordinator that delivered and managed programmes of over 300 players plus parents for children aged 3-12 years old. I was always looking to make a big impact and was happy to create Scotland's first Modern Apprenticeship for Football Coaching in Scotland via Sports Academy of Scotland. We also took 600 players and families to Brazil over 4 weeks for the 2014 World Cup! I also created a lasting Twin Town educational relationship in France. Since being given the opportunity at North Kelvin Sports with their flagship B&B anti-sectarianism project I have relished the chance to put all my experience and skills into practice! I love community work and in particular project work. This is especially true for me when it can play an important part in improving society through education and action. NKSDG are passionate about creating opportunities as well as making a difference in the wider community." We are never happy with resting on our laurels with B&B and are aiming to build on the success of last 2017’s program by increasing our number of partner schools by 50% from 16 partnerships to 24. This will allow us to promote awareness of anti-sectarianism and increasing the projects footprint for P6/7 school children. New partnerships we have built up has allowed us to make inroads into the south side of the city and surrounding local authorities. This creates new opportunities for the team to continue with our complimentary education and partnership working. Involved are: Active Schools Coordinators (ASC), Glasgow City Council (GCC) primary schools; GCC’s Theresa Breslin’s ‘Divided City’ P7 curricular novel; surrounding local authorities (North Ayrshire, North Lanarkshire & East Renfrewshire); Sense Over Sectarianism (especially their Communities United program); Youthlink Scotland; and Action On Sectarianism (AOS). In addition, we are looking to pilot a S6 Sports Leader mentoring programme at secondary schools. This will be carried out by teaching the sports mentors and leaders how to deliver the B&B workshops, allowing them to deliver it to their previous primary schools. This will help develop the pupils’ CV’s and employment skills. We have already brought the successful B&B model to secondary schools in Glasgow in 2018-2019 and will look to develop this further also. North Kelvin United has always been an inclusive club that has promoted equality, understanding, and respect. 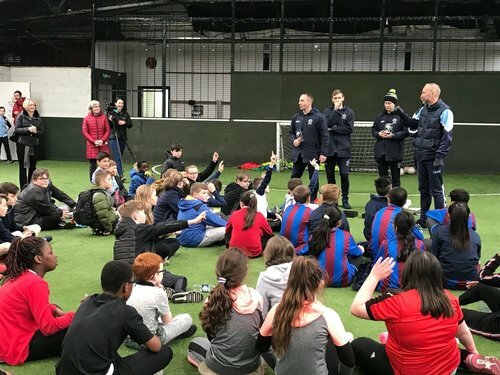 The football club has proven to be an excellent vehicle for delivering Bridges and Barriers workshops to young people and adults which has allowed us to instil the club’s values across the entire club. Our educational resource packs, which have been approved for use by Education Scotland, have also been accessed by community football clubs across Glasgow and staff have delivered education and training on behalf of Glasgow Life, Glasgow City Council, Street League and the Scottish FA.